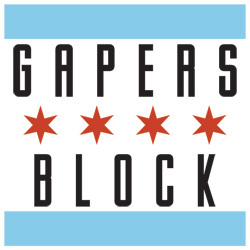 Editor's Note: Chicago Revenant is a new occasional feature by Gapers Block writer Dan Kelly examining some of the less well-known neighborhoods of Chicago -- or as he likes to put it, "shambling through the Second City." This is the first in the series, visiting Dunning and Schorsch Village on the Northwest Side. The neighborhood of Dunning is a perfect place for a horror film — and I mean that in the nicest way. Situated on the northwest side, Dunning (and its next-door neighborhood Schorsch Village), will charm your pants off with gingerbread houses, neighborhood stores and pleasant parks. Simultaneously, the place hosts three graveyards, a mental health facility, a semi-abandoned troubled children's facility and a camouflaged potter's field. It's a pretty place, and I met some nice folks, but it's ripe for a cinematic boogyman. Naturally, I took my 19-month-old son Nate with me. Blithely unaware of anything beyond fire trucks and giraffes, Nate offered little commentary during the three hours we drove around Dunning. Mostly he babbled in the car seat, or tried to outrun me on his stubby little legs whenever we made a stop. I didn't bother with explanations. I didn't need to. Nate's world consists of home and the playground, with little elaboration. It made no difference to him if the Kentucky bluegrass and dandelions he ran across covered the bones of the insane dead or not — especially if a puppy was nearby. Dada knew better. Dunning is the name of community area 17, bordered by Cumberland, Irving Park, Narragansett, and Belmont and containing the neighborhoods of Irving Woods, Belmont Terrace, Belmont Heights, Schorsch Village and Dunning proper. The place dates back to when the Northwest Side was still a rural area on the city's outskirts. The name came from Andrew Dunning, a speculator who bought 120 acres of land there not too long after the Civil War. First Dunning built a nursery. Then, assumably fantasizing about naming a village after himself, he set aside 40 acres for future settlers. But Mr. Dunning failed to consider the effect his peculiar neighbors might have on potential homesteaders. In 1851, Cook County thought the area was a prime spot for a poor farm/lunatic asylum (ah, the pre-euphemism days). By 1863 they started packing in tuberculosis sufferers for good measure. Gradually, the place became a catch-all for orphans, unwed mothers, sick war vets, old folks and other societal cast-offs. By the 1880s the hospital housed more than 1,000 patients, with more arriving every day on the Chicago, Milwaukee and St. Paul Railway — locally known as the "crazy train." Over the years, reports of corruption and gruesome patient deaths, in addition to persistent fears of escape by axe-wielding inmates made Dunning an unattractive place to settle down. Dubbed Chicago State Hospital in 1912, somehow the original name Dunning — with all its funny farm connotations — stuck. Yet, despite this stigma, the surrounding community slowly grew. My first stop in contemporary Dunning was Read-Dunning Memorial Park. Drive down Narragansett, then turn west onto Belle Plaine and you'll find it in the crook of the cul de sac. While a pleasant and spreading stretch of semi-wild green, Read-Dunning easily qualifies as one of Chicago's most unimaginative, if not depressing parks. At a glance it's an uninspired few acres of unmowed grass, twisty trees, a lonely bench, and a winding gravel path intermittently marked by large concrete circles. Until he or she is on top of the first disk, the uninformed visitor won't realize what the park is memorializing: Cook County Cemetery, a potter's field. Founded in 1854, according to the plaque out front, unidentified bodies were regularly interred here, as were other peripheral humans like the aforementioned orphans, sick folks, destitute vets, asylum patients and 117 unclaimed corpses from the Great Chicago Fire for good measure. Records put the number of those committed to the earth at 38,000. Not the place to be during a zombie uprising, though the single bench would provide a comfortable, shaded view. 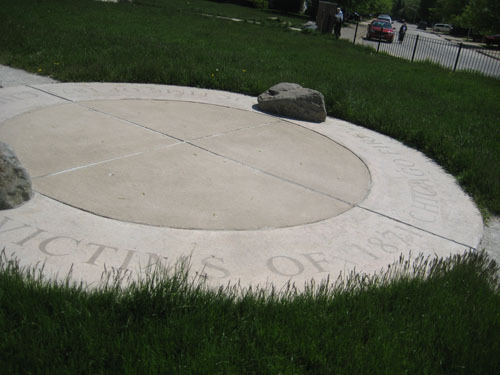 The park's eight concrete disks are marked with words like "SICK AND INFIRM," "ORPHANED/ABANDONED CHILDREN," and "INSANE ASYLUM," rendered in large, century Schoolbook text. Death metal bands seeking cover art, bring your cameras. Despite the park's undeniable "go away" vibe, my indomitably cheerful son went bananas as a pack of small dogs yipped at him from a backyard next to the park/cemetery (parketery?). Lacking social skills, Nate stomped and barked back. We were soon joined by another pack: strolling senior citizens, some of whom looked old enough to have known the cemetery's 18th Century residents personally. Oddly, they also carried small, quivering, rat-like dogs. An old gent walked by with his small coughing cur. Nate reached out, but I told him to hold off from petting tiny, skeletal dogs. "Don't be afraid," assured the old gent in a crackly voice, "He won't bite her." I was too intrigued by his skull-like head to inform him my son is not a girl. Eventually, the old asylum was replaced by Chicago State Hospital, and later the Chicago-Read Mental Health Center. Memories soon faded about what lay beneath Dunning's surface. In a May 23, 1979 Tribune Action Line column, someone asked about the location of the place, but the Action Line folks couldn't turn up "a single reference to a cemetery." Then, according to Graveyards of Chicago by Matt Hucke and Ursula Bielski, construction started on Wright College and nearby condos, and bones began to turn up. People suddenly remembered what was there, and after some organized protest the park was created and re-consecrated in 2001. Cold comfort though that may be to the unknown dead. Filled with more Scandinavians than Lake Wobegon, the closest thing Mount Olive has to a celebrity resident is Ms. Sybil Bauer. Former Schurz and Northwestern student and fiancée of variety show host Ed Sullivan, Sybil was a backstroke champ who earned the silver at the 1924 Olympics. Tragically, she developed cancer and died at the too-young age of 24 before she and Sullivan tied the knot. Mount Mayriv was established not long after Mount Olive, when members of the Chicago Jewish community purchased 40 acres next door. Mount Mayriv has two somewhat better-known internees. Just inside the gate we found Illinois Governor Henry Horner's monument. Horner led Illinois from 1933 until 1940, when he died of a stroke. A man of integrity and Illinois' first Jewish chief executive, Horner was also an avid collector of Abraham Lincoln memorabilia. His collection of Lincolniana now rests in the Lincoln Presidential Library and Museum down in Springfield. A phone call to James Cornelius, the museum's curator, revealed that the governor's collection consisted of 2,000 to 3,000 items. "It's a very good collection of its day," Cornelius told me. While Horner wasn't in the top five Lincoln collectors, he was most assuredly in the next batch. Considering that the biggest collector was the state of Illinois itself, that's not faint praise. Perhaps in speculation of Honest Abe's future greatness, the state had collected Lincoln memorabilia long before he went off to DC. Cornelius, however, sees Horner as the real fire-starter. "Horner's collection spurred the state to think of its collection a bit more seriously," he said. Beyond the cemetery's grounds, Governor Horner was commemorated with a park, a day camp, and the former Henry Horner Homes. His epitaph is sweet and seemingly improbable for a Chicago politician: "He had clean hands and a pure heart." A short jog west brought us to the governor's neighbor, Dankmar Adler — the less-remembered half of architectural firm Adler and Sullivan. Adler and Louis Sullivan turned out Loop masterpieces like the Auditorium Building and Carson Pirie Scott buildings, and long-lost edifices like the Garrick Theater. 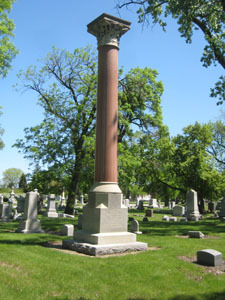 Appropriately, the rose-granite Corinthian column marking Adler's grave isn't just any rose-granite Corinthian column. It once stood in the doorway of the Central Music Hall at State and Randolph, one of his and Sullivan's first projects. Built in 1879, the hall barely made it to 1901 when Marshall Field and Co. razed it and three other buildings to make space for, well, Macy's. Per tradition, most of the headstones at Mount May'riv are covered with stones left by mourners. Building materials seem apt for the departed Mr. Adler. Nate grew restless, and we returned to the car to head further south on Narragansett. While graveyards are always a good time, it was time to move to a happier place. 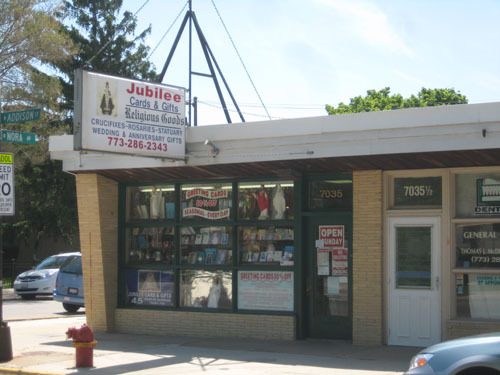 We found Jubilee Cards and Gifts, a Catholic religious goods store, at the corner of Nora and Addison. Raised Catholic and a devotee of Our Lady of the Perpetually Intrigued by High Weirdness, I've always gravitated toward shelves of plastic holy people. Strapping Nate into his stroller to avoid potential sacrilege (toppling Blessed Virgins like bowling pins or gnawing off St. Michael's angelic head) we went in. Surprisingly, they're open Sunday. Inside, we met Elizabeth, filling in for the store's owner that day. She apologized that the store was a bit cramped that day — they were remodeling. We were up to our necks in iconography. On the far wall rested a collection of Infants of Prague. As Andy Warhol proved, when you multiply the ordinary, it becomes extraordinary. Pretty Baby Christs looked down on us, flouncily resplendent in priestly robes. Elizabeth informed me that Infants of Prague and their ornate gowns have been the store's specialty for years. Founded in 1962, Jubilee was originally located on Belmont and Central, until they moved 25 years ago. She joked that the store is staying put, since the owner's friends won't help him move any more. It's understandable. The place is surfeit with Catholic ephemera. Cards; jewelry; rosaries; baptism, communion and confirmation gifts; books; crucifixes; candles; Bibles; frames; and plenty of statuettes. Jubilee has enough St. Joseph figurines to sell Wrigley Field a dozen times over. The entire time we talked, iconoclastic Nate tried to escape his stroller's bonds to wage holy war. Elizabeth kindly bribed him with a Beanie Baby iguana, canceling plastic Götterdämmerung. Exiting the shop, I made a random decision to push Nate's stroller east on Addison. I passed Shabbona Park and we perambulated the grounds. According to the Chicago Park District website, Shabbona was one of four parks established by the Old Portage Park District, before they were absorbed by the CPD. Massive Portage Park at Irving and Central — established in 1913 — gave the citizens of Dunning a case of Me-Tooism. While half the size of Portage, Shabbona offers room for softball, dog walking and sun worshipping, while the Georgian-style fieldhouse, pool and gymnasium provide other distractions. The name came from Potawotami chief Shabbona. Back in the 1830s the chief rode for two days to warn white Illinois settlers that Sac chief Black Hawk was coming to reclaim his ancestors' lands by any means necessary. Shabbona was given the thanks of a grateful nation before they packed him and his family off to a reservation out west. Twenty years later he moved back to Ottawa, IL, where he was reportedly warmly received. If he'd been in Chicago, and alive, when the park was built, I'm sure he would have been flattered. Heading back east on Addison revealed that most local businesses, like Jubilee Cards and Gifts, had very specific raisons d'etre. For instance, places like Joseph's Finest Meats (reviewed in Drive Thru last year), which promised the pleasures of the edible flesh with colorful window placards. Sadly, there would be no barbecuing for us that evening. Joseph's is closed on Sundays. As a devout carnivore I know I'll be back. A swift stroller turn southwards took us through Schorsch Village. Per the Encyclopeda of Chicago, Schorsch Brothers Real Estate bought and developed the land in 1916. At first they tried calling it West Portage Park — Dunning still being synonymous with the looney bin and all. Schorsch Village took instead, and a good thing too. It really does look like a quiet, orderly little village of small, fairy-tale homes — largely brick, slanted-roof cottages and bungalows. It's quiet there; as the saying goes, TOO quiet. The homes are so absolutely quaint, charming, petite and garlanded with shrubs and flowers, I half-expected gnomes to spill out every front door, or — worst case scenario — legions of life-sized gingerbread men, armed with tall glasses of milk. Truthfully, Schorsch was a little boring. At any moment, I felt like nothing might happen. I moved at double-time to get back to the car, Nate gigglingly exhilarated by the sudden acceleration. Packing up Nate into his car seat, he gazed at me inscrutably. "Bet you're hungry," I said. Nate answered with a sudden exclamation of "O's! O's! O's!" toddlerspeak for Cheerios (no product placement intended). 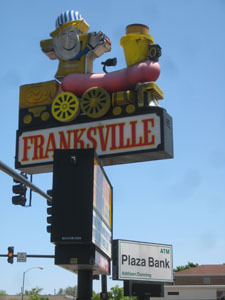 Pulling onto Harlem Avenue, we were confronted with a vision — Franksville's (3550 N. Harlem Ave.) wiener choo-choo sign. Lacking the totemic power of Superdawg's Tarzan hot dog, it matches it in terms of pure Dada. I stopped for a picture, but skimped on buying Nate a chili-cheese dog. We drove further north, looking for a place to chow down. I pictured the perfect restaurant in my head. A family eatery — some 50-year-old diner dripping with Chicago character. If Dunning has one, we didn't find it. We ended up at a Borders coffee shop to share a bagel and a bottled water. Unconcerned with authenticity, Nate happily noshed while I felt the trip was winding down. Looking at the street signs outside, I also realized we'd veered into Norridge, fudging on my rule about staying within the neighborhood's borders. As Nate painted his face with cream cheese, I reflected on Dunning. For all their odd history, Dunning and Schorsch Village are placid and pleasant bedroom communities. People do more living than working there, I think. Other outstanding landmarks in the area didn't allow for casual tourism. Eli's Cheesecake Factory held no appeal, Wright Junior College promised few thrills, and security at the Chicago-Read Mental Health Center would probably frown at a request for a tour. The former Maryville Center for Medically Complex Children on Forest Preserve Drive and Oak Park Avenue, is apparently popular as a ghost hangout (for those who believe such things). To my eye it was also likely rife with broken glass and lung-searing dust. The only spooky thing I could see was the tetanus-tinged playground equipment, guaranteeing lock-jawed doom for any toddler brought there by his idiot father. Enough was enough. It became clear that Dunning was just so overdone. Postscript: As it turns out, when the Dunning poor house/TB hospital became overcrowded in 1910, the county closed it and opened another one in, of all places, my hometown of Oak Forest. I could go home again. 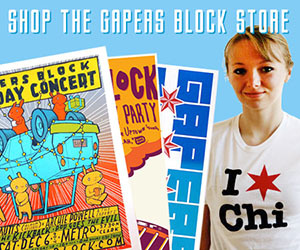 Many thanks to the invaluable online Encyclopedia of Chicago. The mother of a friend of mine lived in one of those condos. We could never tell her about the graves--we were sure she'd start seeing the ghosts of crazy people. Catch him at the Messenger Prom. Wish you had visited us at the Eli's Cheesecake Cafe during your visit to Dunning. We have a great Thursday Farmers Market with Wright College on Thursdays and offer lunch and dessert. Found your comment really interesting. Grew up right along Addison Street, my parents having moved there when I was 2 months old. After living downtown, then New York, then Washington, DC, and then Toronto, I've wound up owning and living in the same house I grew up in. The neighborhood has changed somewhat in the past years, but is still a decent place to live. I wanted to sell the old family house, but with the current real estate slump, its not a option, so I'm fixing it up and staying here. In regards to Dunning, I remember as a child, when the siren would go off announcing that someone had escaped, and we had to run back home again. A railroad used to split the cemeteries right where the townhouses are now on Addison Street, and you could walk along the right of way up to Irving Park Road. You're right about the local diners being gone now, but you might want to try Gruba Ryba right down the street from the meat market, pretty good Polish place with more than the usual Polish food. Great article. I am looking forward to other entries in this series. Thanks! Thank you so much for a wonderful, beautiful piece. I grew up in Chicago and now live in Florida, having relocated for work. I'll always miss Chicago, until I come home! Thank you again! Great article! A fun read. I've lived in Belmont Heights/Dunning for nearly 28 years. I'd like to add that certain characteristics of Dunning have resulted in the lack of the type businesses Dan Kelly describes as "totemic" or "dripping with Chicago character". Dunning has largely been populated by first- and second-generation Italian-Americans, city workers, and most recently Polish and Hispanic immigrants. Recent immigrants tend to be insular and create businesses that largely cater to their own ethnic groups. There was a well received, upscale restaurant on Belmont Ave., Paprikash, but it has unfortunately closed. If I were to compare Dunning with another Chicago community area, I'd have to say it resembles Garfield Ridge. Close to an airport (but not too close), tidy bungalows, lots of city workers and strong immigrant presence. The dominating presence of Harlem-Irving Plaza is a double-edged sword. While it draws many shoppers to the area from the entire northwest side it also has a retarding effect on the development of boutique businesses that have unique appeal. It's really the only "destination" business in Dunning. The lack of a walkable business area pretty much relegates people to driving in and driving out. It seems to me that Dunning should now be more attractive to urbanites priced out of other city neighborhoods. Home prices have dropped and there are bargains to be had. There's decent Metra access to downtown from stations in River Grove and Elmwood Park. BTW, Mike Royko is interred at Acacia Cemetery on Irving Park Road. As a southsider, I had only heard of Dunning in negative terms. If someone was "not all there" it was said that they should be sent to Dunning. In my mind that was even more terrifying than being sent to Montefiore. I always thought that Dunning was in the country where the inmates couldn't bee seen or heard. Thanks for a great article. I look forward to the next installment. Ah, my neighborhood. Unfortunately I have had the pleasure of being inside of Read Mental Health Center. Have you seen Halloween where Michael Meyer's escapes? It has that vibe. Basically because so much of it was closed down at that point and you had to walk through so many empty corridors to get to the active wings. That and we used to play softball on the grounds. Whatevs. Creepy though. But yeah, I miss all the local stores and bakeries that are now gone. My family refers to the strip mall at Irving and Narragansett as Poltergeist Square... given the bones that turned up. Neighborhood rumor was the place was an indian burial ground. My mom knew it was a potter's field... poltergeist square all the same. Regardless, the cemeteries were the BEST place to play ghost in the graveyard last at night. What a wonderful article! I felt like I was right there with you. Please, please write some more! I read somewhere that when there was a full moon, a man used to escape from Dunning and run to Mt. Olive Cemetery. They caught him there several times baying at the moon. Enjoyable to read. Nice writting style. This past fall (2009) obtained EVPs at the Memorial Cemetary of giggling and 2 separate times horse walking on hard surface (unmistakable). Nothing heard with the human ear while there. Plan to go back this spring and check out the place some more. Interesting, yet sad place. Sorry, that so many are buried there and forgotten. Thanks for posting a great article on an area I love. The community there is so nice. Housing is at a great bargain now too. I'm deciding whether to do a refinance mortgage or possibly sell my home and move into the gothic, yet warm community. Perhaps in speculation of Honest Abe's future greatness, the state had collected Lincoln memorabilia long before he went off to DC. Cornelius, however, sees Horner as the real fire-starter. Neighborhood rumor was the place was an indian burial ground. My mom knew it was a potter's field... poltergeist square all the same. 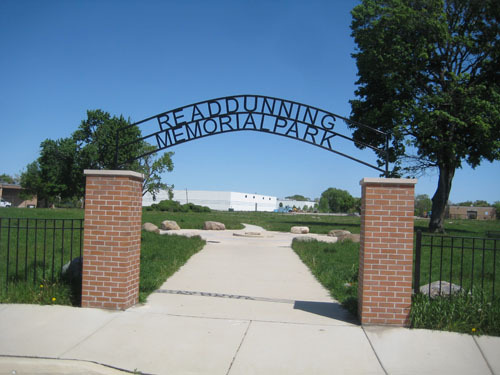 I actually just came across the Read Dunning Memorial Park just yesterday and was thoroughly intrigued by it. I have never been much of a history buff, but I quite enjoyed walking the path and reading each bronze plaque in turn. I loved it so much that I took my girlfriend today to check it out. Also, I told my grandmother about it. She just so happens to live in those condos right there. Grant it, even though she lives close, I doubt she will ever go. oh that is must be a spooky place. i spent 2 hours on a grave accidentally, holding my financial management degree. after wards i felt a little fear, but that was an adventure too. Great post! Thanks for the info very useful information. I hope to see more posts soon! Useful information. I hope to see more posts in the future.